We read a host of data and information on merger and acquisition in 2009.We found global data regarding merger and acquisition and many cases every economy data too. But I am not going to repeat the same old data for any type of analysis. I will try to bring forth the upcoming trend and foresight of the merger and acquisition in 2010 which will derive the growth as well as consolidation of industries across the nations. 2010 will be a Harbinger of merger and acquisition activities globally. The journey will begin in 2010 from Independent firms will help shape the mergers and acquisitions scene in the asset management industry in 2010. Oil and gas companies will increase acquisitions in the first half of 2010, particularly in Asia. the hottest areas in a deal making market that in 2010 around $2.1 trillion dollar will be the volume of deal making in 2010 expected. • High levels of cash into the system. 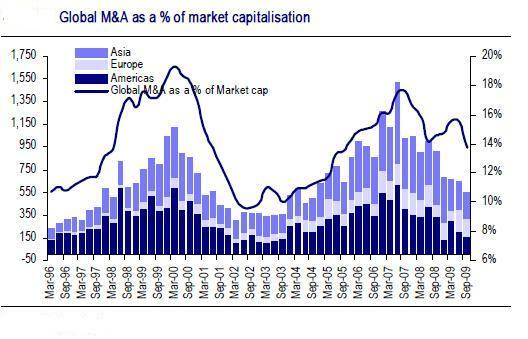 The below chart depicits the global M&A market capitalisation. The Companies which are taking aggressive actions on costs; are going to look out for the low hanging fruit is and to drive further efficiency they will look to combine with similar players to drive scale and enhance market and increase consumer base. Diversification is now not on product wise but on geographical expansion .Companies are more focused to expand consumer base and to take advantage of cheap economic valuations. Cash on balance sheets of the companies are sitting idle. If the companies don’t go for any use of those funds then it have to be returned to the shareholders. But all these advantages add taste to that cup of tea where the economy is not after post recession. Merger and acquisition in any economy after post recession have a different meaning as a whole. 2010 M&A will be completely different from the historical deals. When we look in to the post recession M&A we don’t get much advantages of economies of scale and other factors. Its curse for an economy to gets its small enterprises and business eaten up particularly by global peers . Domestic acquisition creates a consolidation which is good for an economy in one perspective that later on consolidated industries will make that economy more beneficial. But when overseas merger and acquisition happens its turns out to be a curse for an economy. • We get higher unemployment in M&A. • Particularly in times of recession the figure of unemployment jumps like anything. • M&A in times of recession gives more reward than normal times of M&A. M&A in the recession spark waves of consolidation in many industries. • Weakened companies will need buyers to survive, while strong firms will take advantage of low stock market valuations to buy troubled rivals at discounts. • We also know that when M&A happens in recession times unemployment is must item to go up. • No Buying company will like to carry on with excess working staff. So higher number of M&A in 2010 is not a good news.What we need to see the long term strength of economies who are having acqusition at domestic level and overseas buyout.This will decide the long term industrial strength of the economies. 29th Januray RBI Policy Meet. NEW DECADE OF AUTO SECTOR.